Nasty Gal is a brand that has a serious fashion heritage. The label was officially launched in 2012 but grew from the LA vintage store of the same name, which first opened its doors in 2006 and informed many of the designs that now form part of the Nasty Gal collection. You can still find some vintage gems among the lines from this brand, which is one of the reasons that it is so popular. The youthful and confident aesthetic of the brand is exciting and the broad range of trend driven designs is intended to engage young women in their late teens and early twenties but also has a much broader appeal. Shop the line of wedges from this brand for super high wedge boots, vintage style platforms and sleek mules, as well as contemporary takes on traditional designs, such as Oxfords. 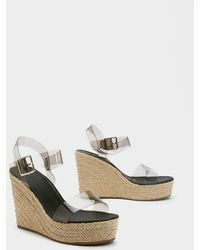 "up To The Challenge Raffia Platform Wedges"
"in The Open Perspex Woven Wedges"
"step Up Cork Platform Sandals"
"beg Toe Differ Clear Platform Wedges"
"espadrille There Be Sun Wedge Sandals"
"the Wedge Of Glory Wrap Woven Sandals"
"enough With The Cork Leopard Platform Sandals"
"sunny Afternoon Espadrille Wedge Sandal"
"work It Cleated Platform Sandals"